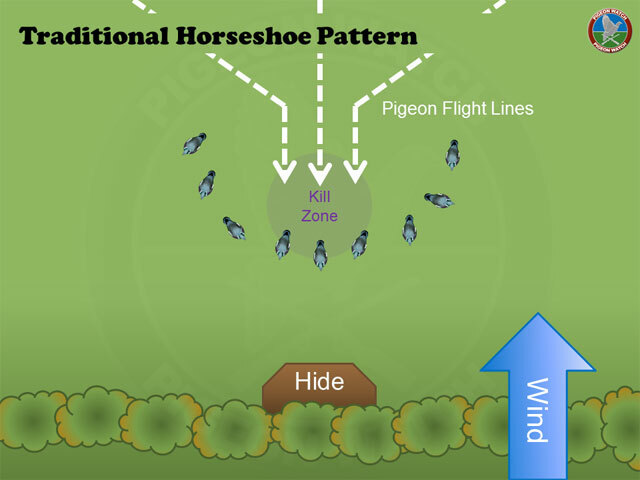 To be able to attract the pigeon into range of your hide different decoy layouts can be employed, the basic concept is to spread the pigeon decoys whilst leaving a corridor and decoy free ‘landing zone’ which incoming woodpigeons can safely land in, this is often referred to as the ‘killing zone’ and should be no more than 30 yards from your hide to ensure clean and accurate shooting. 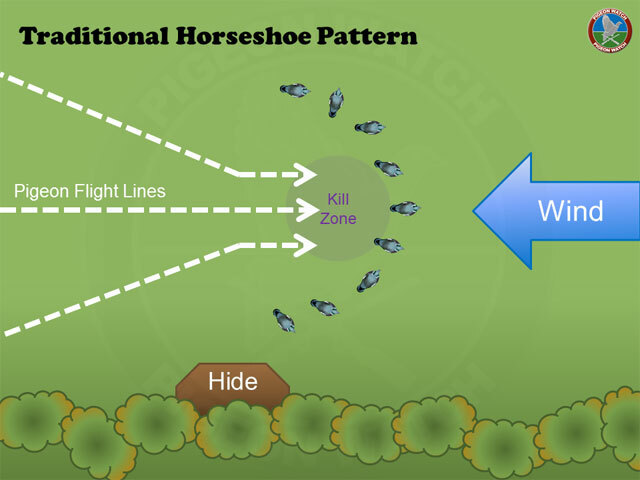 The most popular setup is the Horse Shoe pattern, where the decoys are laid approximately face into wind, in the shape of a U, a diagram of this is shown below. face some decoys at different angles, this give a more realistic looking flock. If you can (not always possible due to location), get the wind at your back. 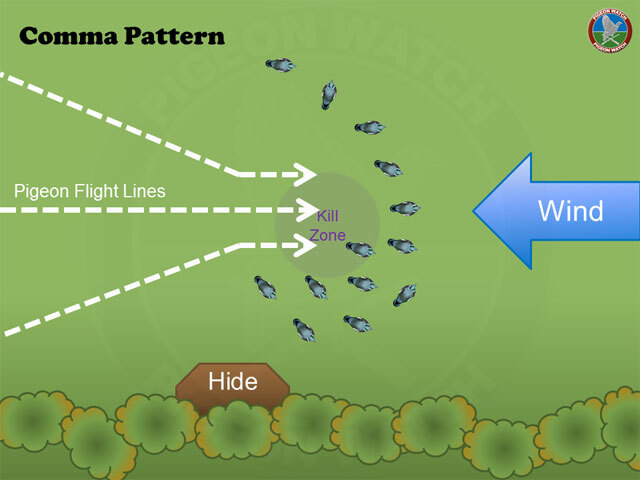 Turning the pattern into an elongated L can help stop pigeons from veering out to the side. 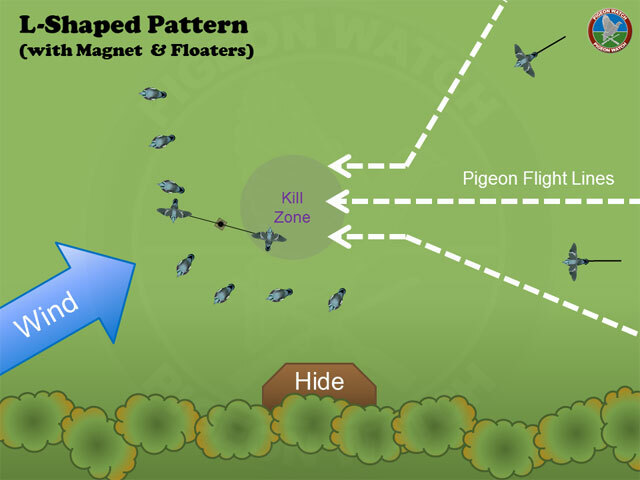 Magnets, Flappers, and Floaters (Bouncers) can be added to the pattern to increase movement and hopefully attract birds in. 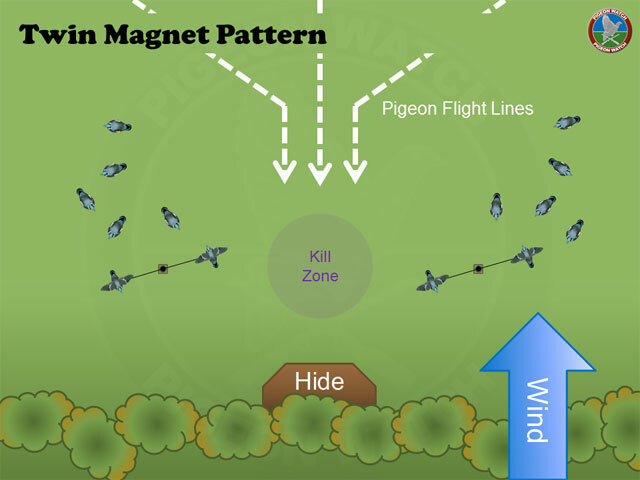 Do not be afraid to bring a magnet in if it's scaring the birds (they fly towards the pattern but then veer off before reaching the killing zone). Sometimes, being creative with your pattern can really help with the numbers. Just remember the principle is to channel the birds in to the killing zone. You should use somewhere in the region of 8-20 decoys - too few and the pattern is patchy, too many and it's overcrowded. 1) Adapt the decoy pattern depending on the wind direction, cover, crops. 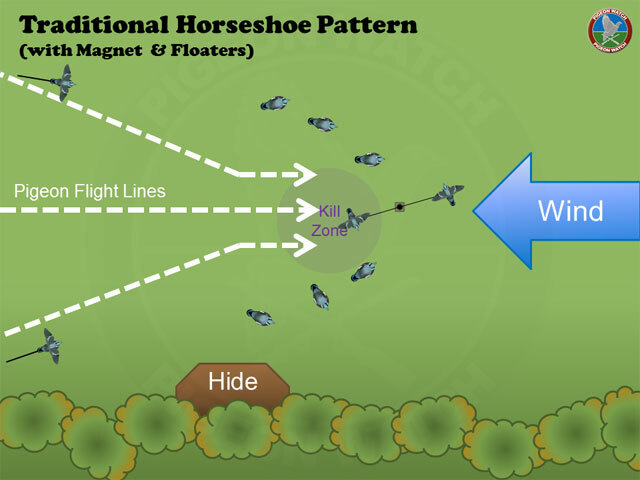 2) The kill zone should be roughly 25 yards from your hide. 3) Never have the sides of the U too close or the pigeons will not land. Leave a good 30 yard gap so the pigeons have somewhere they feel safe to land. 4) If you can (not always possible due to location), get the wind at your back so that the pigeons land into the wind. 5) Always make sure the majority of your decoys heads face into the wind, but not in regimental fashion, face some at different angles. 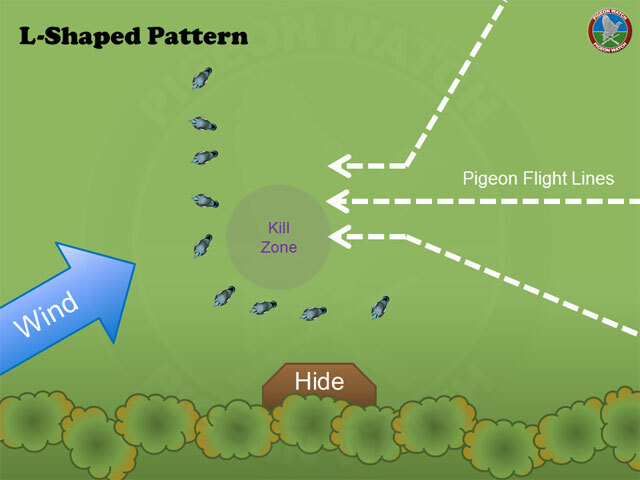 6) Add shot birds to the pattern, but do not overcrowd it - if a pigeon doesn't have a clear path out of the pattern, they won't feel safe.